The Petersons at New Hope Uganda: Here in Kenya. Yes, we are in Kenya, Because my Dad is teaching in an institute here. We started on Saturday morning and drove to Kampala. We stayed the night there and the next day, Sunday, we started off to Kenya. We got to the border and had to go through a process that took almost two hours long. Then we kept going until we got to Kisumu, the place where the institute was and where the place where we were going to sleep at was. So we slept the night there. Then the next morning we went to the institute and found out that the institute was also a place for some homeless kids, but we still had fun. In the morning Kara and I would do school and when I would get done with school I would go out to play. Then after lunch our whole family would go back to the hotel. We did this the whole week. On Wednesday we went to a zoo type place with animals. There were leopards, monkeys, birds, lions, african buffalo, impala, kudu, dikdiks, turtles, zebras, and hyenas. But the best part of the whole trip was something you’ll never believe. Back in the states we got to pet and hold tiger cubs. But this is way better. We actually got to pet the fastest land mammal on earth… A CHEETAH! Yes, yes, we are not scratched up or torn apart. 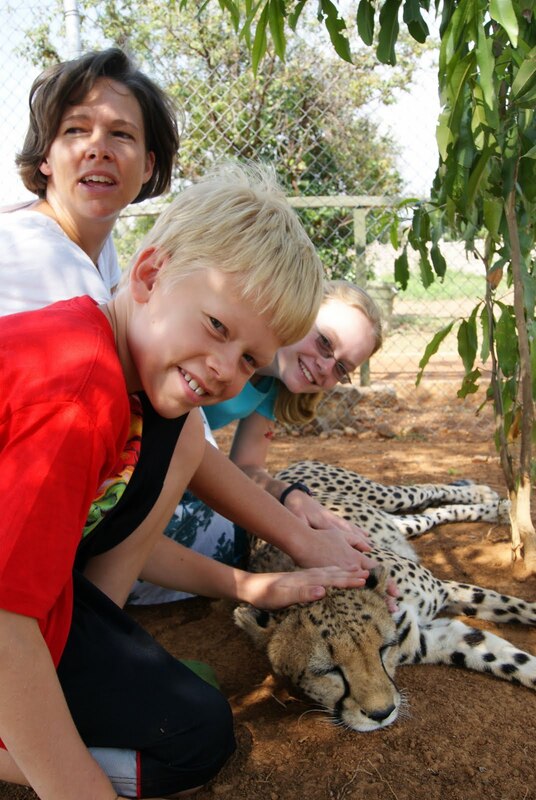 The cheetah we got to pet was raised as a cub in human care, so she was tame. She actually (as the only big cat that can purr is the cheetah) purred when we pet her! And it only cost about $3! So we had fun that day. But then that night, on the same day, Wednesday, there was a minor disaster. So after coming home from a restaurant we decided to play a game, since it wasn’t to late. Before we started, Kara and I looked out the window. We saw little things on the window starting to gather but we ignored them. We started playing when suddenly my dad said “Look! A mosquito!”. (Mosquitos carry malaria). He smashed it, then we saw on the wall about ten of them. Then I turned around and saw, like, 200 on another wall! We called the desk and asked someone to come spray the room with doom. We saw that they were getting in through a gap beneath the window. Before the sprayer came we looked closer and saw that they were lakeflies, not mosquitos. So that was a relief and an adventure. Today we are going back to Uganda, because it is Friday. Thank you all for your prayers. Thank God for the safe trip for us. Thank you all for your support and prayers.